What began as an experiment became a way of life. Gina has favorite stories that she shares with her students, offering metaphors and using examples of her direct experiences in connecting with animals, trees, stones, clouds and Nature Spirits. Gina emphasizes the value of your own "direct experience" in her Advanced Workshops, and she has learned that the direct experience is what students are really seeking. She aims toward education in telepathic animal communication in the Basic classes, laying the foundation that prepares students for the advanced work. She is currently writing her book, to be published in the Fall of the year 2000. Gina keeps in touch with her students and clients by publishing a quarterly "Paws & Claws Newsletter." The newsletter is available to anyone wishing to subscribe by phone or order form. Gina maintains that optimum health provides optimum results, physically, emotionally, and spiritually. She has researched and stocks most of the holistic products for animals and their people: animal nutrition, flower essences, aroma therapy, color light and sound therapy, and bovine colostrum. Gina is available for private consultations and telepathic communication sessions by phone, including long distance, for clients with pets experiencing serious illness, decisions about euthanasia, lost animals, behavior resolution, grief for lost or deceased pets, senior animals, animals moving and transitioning, and spiritual healing. You are free to tape-record your live sessions if you wish. Gina Palmer began her studies in telepathic communication in Yucatan, Mexico, with Mayan Record Keeper and Elder Hunbatz Men. She is a graduate student of well-known Animal Communication Specialist, Penelope Smith. Gina is not only an animal advocate, but also advocates and encourages other animal communicators. She recognizes the strength and value in networking, providing referrals to other animal communicators upon request. 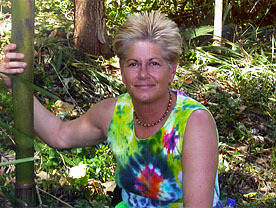 Gina lives in San Diego, California, with twenty-one animal companions and has traveled with several of them for extended periods of time. Having traveled to the sacred sites in Peru, Bolivia, the Yucatan, and many of the U.S. energy vortexes, she has learned that the greatest teachers of all are the animals, themselves. Advanced studies in energy work within the environment of a natural energy vortex or sacred site is incredibly rewarding. Gina periodically arranges for groups of advanced students to travel together to global sites. If you are interested in participating in national or international journeys, call 760-533-0778 or e-mail our office for the current schedule. I was part of a group of six students studying in Yucatan, Mexico with Hunbatz Men, Mayan Record Keeper and Elder. We had traveled the sacred pyramids, learning how to open and work with their energy. Hunbatz introduced us to the Mayan term "In Lakech" which, roughly translated, means "I am another yourself." In Lakech includes all species, all forms of matter, stones, trees, etc., without separation. After three days of working the energy within various pyramids, Hunbatz prepared a special ceremony atop the pyramid of Dzibilchaltun. The weather that day was balmy, and several cumulus clouds hung lazily in the Yucatan sky, giving the impression of gigantic cotton balls suspended below the tapestry of blue sky. From the top of the pyramid, we could look out over the lush greenscape which rolled out in every direction far below us, seemingly unending. Hunbatz asked us all to reach out and touch one particular cloud. Pointing his index finger toward the sky, he instructed us to remain quiet and feel the cloud through our heart center. He asked us to feel the qualities of the cloud, its texture, color, size, and location. He then instructed us to bring those qualities into ourselves through the area between our eyebrows. He reminded us that the cloud too was, In Lakech, and that all manifestation is Spirit or the Activity of God. Hunbatz told us to ask the cloud to dissipate, so we could verify for ourselves the loving connection we had all established with it. The cloud literally vanished right before our open eyes! Later, Hunbatz explained that the cloud had heard our intention and had simply agreed to participate with our request to dissipate. I felt the connection in my body the instant the cloud acknowledged our loving focus. Hunbatz explained that the principles he was teaching us could be applied in communication with all life, just as they had been in ancient times with his people, before telephones and technology had become the norm. He asked us to teach the rituals and the use of telepathic communication to others upon our return home. Telepathic communication is everyones birthright and is only waiting to be re-awakened, just as it had been with us that day! Click here to learn more about the Mayan and Hopi connections with Ginas work. When I returned from the sojourn, I realized that my senses had been heightened and that I was able to discern conversations with my companion animals, and even the wild birds, trees, and rocks. It felt as if I was hearing them from somewhere inside myself. A conversation I had with my nine-year-old feline, Shera Lee O Ma Ra, showed me how much my life had changed. Shera told me that she had chosen me as a companion and that she had come to be my teacher. She also said that I needed to take a sabbatical from my ordinary existence and relinquish my identity as a business woman, at least for a while. When I asked her to describe the identity I was to assume, I heard her say "wanderer"  that I was to be in the world "in a new way." I was to be a student of nature and learn all that I could from "the Earth and all of Natures creatures." Initially, I greatly resisted relinquishing the life that I had made for myself, my successes, my home, friends, and social standing in my work. But, a little at a time, I began my release, which culminated in selling my home and most of my possessions and leaving my business. Prior to my trip to the Yucatan, I visited Macchu Picchu, Cusco, Kusiyachyoc, and Pisac in Peru, Lake Titicaca in Bolivia, and began my studies with a well-known animal communicator in Point Reyes, California. Over the next few years, I evolved into the person I had always believed I truly was. The business woman I had been had helped me raise two children as a single parent and afforded me the opportunity to unfold naturally. Now I had to let go of this identity and become a "wanderer." We were reunited with Shera on the road after she had been "missing" for seven days. These and many, many other experiences occurred on our journey. Our only responsibilities were defined by our slogan: "no where to go, and all day to get there." I learned that when we give the gift of time to ourselves, ordinary experiences take on extraordinary qualities for learning, living, and loving. The animals taught me that animal communication is a language of love, and that through loving ourselves we experience the first rule of life: to thine own self be true. Animals are loves ambassadors, beloved teachers and masters of the unconditional and unbounded aspects of beingness. Telepathic Communication is achieved through compassion, empathy, and full presence. Animals can put us in touch with our authentic power. To communicate with them is to literally stand in the presence of love disguised in fur, feather, hoof, wing, paw, and claw. They are masters in disguise. Animals anoint, bless, cleanse, and restore wholeness. They return us to the sacredness of the earth, teaching us the art of attunement. To the degree that one is able to discern the aspect of Spirit through the physical veil and to disconnect from mass consciousness and reconnect to our essential Self and to Spirit, is the degree to which we will be able to communicate with other forms of life. Whether the object of our communication be animal, vegetable, mineral, nature spirits, angels, clouds, or the true self of fellow human beings, we can only have genuine communication from a place of egolessness and Spirit centered awareness. We live high on a hill in Southern California with a view of the Pacific Ocean, oriented in such a way that the moonrise and sunset hang opposite one another at dawn and dusk. We work with the elements of Earth, Water, Air, and with our twenty-one animal companions  dove, quail, canine, feline, chicken, reptile, and parakeet  who continue to teach us while we work with students who come to the sanctuary to learn basic and advanced skills in animal communication. We offer group and private sessions, teaching on totem power animals and nature spirits. We give private animal communication sessions by telephone to local and long-distance clients, as well as in person. These can be tape-recorded. We travel on request, delivering lectures, classes, and seminars. We keep in touch with students and clients through our quarterly newsletter, Paws & Claws. Paws & Claws is available to anyone wishing to subscribe.